The Specialty Equipment Market Assn., commonly referred to as SEMA, is drawing thousands of people this week to Las Vegas, where the world’s largest aftermarket parts show for light trucks and cars is underway. GM, Ford, Fiat Chrysler and other automakers used the sprawling opportunity to show off a slew of new technologies and designs. The show offered first looks at long-teased models, several of which were created as part of partnerships with energy drink companies, surf gear designers and industrial work apparel manufacturers. GM’s Chevrolet brand exhibited its new emissions-free Colorado ZH2 hydrogen fuel cell pickup truck, the result of a recent collaboration with the U.S. Army. A large crowd observed showcasing the vehicle’s ability to act as a mini power plant, creating both electricity and water. Chevrolet debuted its Silverado Alaskan pickup truck affixed with a massive stainless-steel snow plow. The rugged concept — which is based on the heavy-duty Silverado 2500HD line and features GM’s new 6.6-liter, 445-horsepower V8 Duramax turbo-diesel engine — also comes with a salt shovel, snow gloves for the driver, ramps, jumper cables and chrome accents. Chevrolet also released a catalog for enthusiasts to order these same components. Also new to the Silverado 2500HD collection is the Carhartt concept, which refines features of Chevrolet’s heavy-duty work trucks via a partnership with Michigan-based clothing company Carhartt. The 2017 model includes a built-in 4G LTE WiFi hotspot as well as an electrical outlet in the truck bed, which is shielded by a tonneau cover made with Carhartt fabric. Chevrolet also used the material for the vehicle’s seats, armrests and door inserts. The automaker a showed off its 2017 Chevrolet Silverado 1500 High Desert concept, created for an outdoorsy lifestyle with space for hunting and fishing equipment. To handle off-road driving, the pickup uses a 6.2-liter EcoTec V8 engine, a 6-piston Brembo brake kit and magnetic ride control. The truck is also a looker, with an embroidered headrest, anodized bronze accents on a slate-blue exterior and an interior swathed in Napa leather and silver finishes. Chevrolet’s water-ready Colorado Hurley was also featured with custom Pyzel surfboard storage on the top, 17-inch Chevrolet wheels with Goodyear DuraTrac all-terrain tires, and a Thule rack under the Bimini-style bedcover. Painted in a shade of custom Seafoam Green and equipped with a snorkel, this truck was co-designed by California apparel company Hurley International. Chevrolet also introduced its Trax Active all-wheel drive SUV concept with all-weather floor liners and folding rear seats, which accommodate mountain bikes or camping gear. 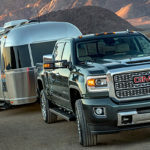 The vehicle includes a Thule cargo basket and a front-facing LED bar on the roof for lighting along with 18-inch wheels and all-terrain tires. 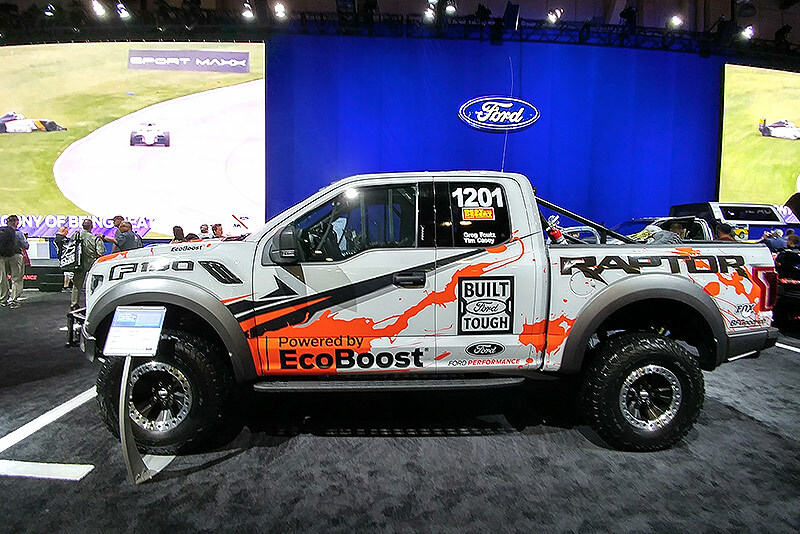 Ford’s F-Series brought some serious muscle to SEMA, displaying the F-150 Raptor truck that will compete in the rigorous SCORE Baja 1000 race in Mexico later this month. The automaker worked with Foutz Motorsports to modify the truck for the endurance run, giving it a 10-speed automatic transmission with paddle shifters, racing shocks, beadlock wheels and a roll cage. Ford’s booth was brightened by the lights and sirens attached to the F-350 XL Matchbox Police Crew Cab, a toy truck turned into a life-sized, fully-functional tactical police unit. Gear can be kept in the TruckVault in the bed. Ford also featured its F-250 Super Duty XLT Widebody, with lightweight Forgiato wheels, Lexani tires, customized Atlas Springs suspension, full leather Katzkin interior and painted trim pieces. The off-road ready F-250 4×4 Shockzilla has a custom paint job by Haynie Designs as well as 20-inch Moto Metal wheels, Nitto tires and a Fabtech 8-inch suspension system with coilovers. Hyundai based two of its SEMA concept vehicles on its Santa Fe SUV model. The “Santa Fast” design by Bisimoto is a custom rear-wheel drive with 1,040 horsepower, a 3.8-liter Hyundai engine and a rear differential from the Hyundai Equus limousine. This concept is purely a design exercise demonstrating the potential to personalize a Hyundai. Hyundai’s second concept is a Santa Fe off-roader built in tandem with Rockstar Performance Garage. The garage, launched in 2012 by the Rockstar energy drink, helped construct a nitro-powered all-wheel-drive vehicle that has massive 35-inch off-road tires and King suspension. Hyundai also showcased its production-ready 2017 Tucson Night SUV, which follows a recent trend among automakers of dark, blacked-out designs. When it goes on sale later this year, the Tucson will sport 19-inch wheels with black and red finish, a panoramic sunroof with tinted glass and glossy black side-mirror caps. Fiat Chrysler’s Jeep brand featured its off-road Comanche and its military-inspired Crew Chief 715. The Comanche is equipped for all weather conditions, while the Crew Chief boasts an aircraft-like control panel and leather bucket seats. The Jeep Wrangler was named the Best 4×4 of SEMA. Jeep brought a CJ66 and a Trailstorm concept to the show, which both showcased purchasable parts. The Copper Canyon-skinned CJ66 included 17-inch beadlock wheels covered in 35-inch BFG all-terrain tires, Wrangler JK headlamps, rock rails with integrated rub rails, skid plate Dana 44 front and rear axles and more. Climbing on rocks, the Jeep Trailstorm concept showed off its 17-inch off-roading wheels covered in 37-inch BF Goodrich Mud-Terrain T/A KM2 tires. The 2-inch lift highlighted the Fox shocks, Jeep Performance Rubicon parts and Jeep Performance Parts big brakes. At Dodge, the lowered, three-row Durango Shaker crossover concept comprises a mishmash of parts from the automaker’s other models. The SUV features a hefty 6.4-liter, 392 Hemi V8 engine sourced from the Charger and Challenger. Six Viper seats make up the interior; the exterior has a functional Shaker hood and fender flares. The beachy 2017 Chrysler Pacifica Cadence, now one of the coolest vans on the market, sports 20-inch Mopar wheels running boards and graphics as well as a custom rooftop surf- and paddle-board carrier. There’s even a built-in pet kennel, splash guards and wireless charging capabilities. Ram trucks rounded out FCA’s truck display with the Macho Power Wagon decked in Macho Mango custom paint with 37×12.5-inch Nitto Trail Grappler MT tires on concept 18-inch beadlock wheels. While it has custom graphic and a custom hood, many of the interior items, including the utility bed rails and cross rails, can be ordered from Ram. 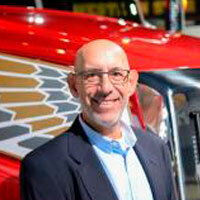 Trucks.com: It depends on the model.